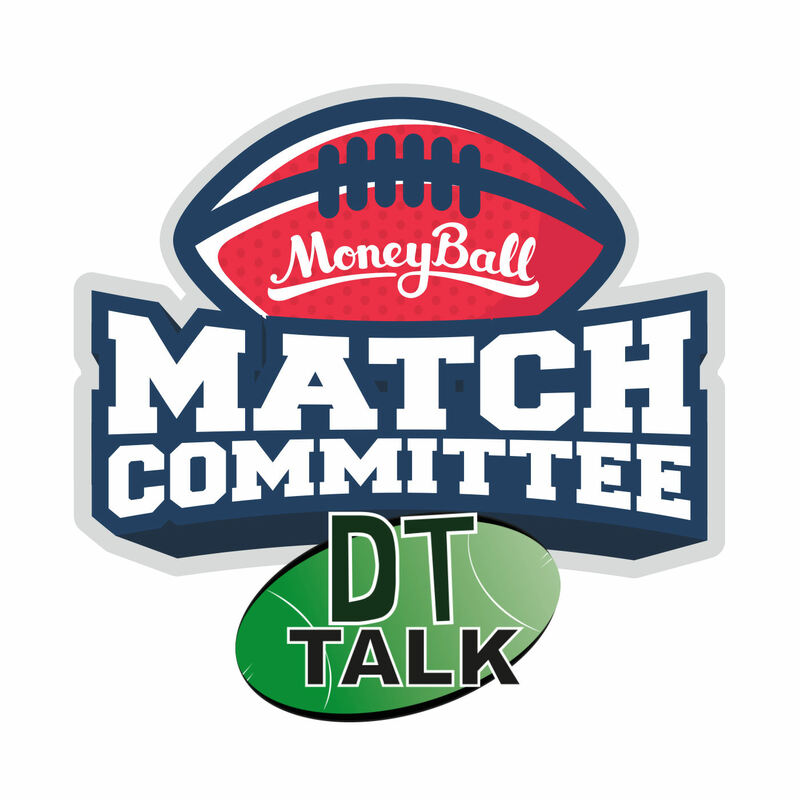 Kick off your DFS weekend by checking out the Match Committee Podcast, then surround yourself with our sneaky Moneyball stats for every contest across the entire weekend. Good luck, punters! Something was clearly wrong with Scott Lycett ($7,300 RU) last week – you simply don’t just become a spud overnight, playing just 54% game-time and finishing on a vomit-inducing 8 MB points. I haven’t been able to unearth any specific excuses for him, which is worrying and suggests there’s some sinister brewing under the surface. Join the huge $7,000 guaranteed Eagles vs Hawks Special here! The safe move is to pick up Nic Naitanui ($7,400 RU) instead, fresh off his game-winning 114 MB last weekend. NicNat swatted down 42 hitouts against the Hawks earlier this year, so hopefully his aerial dominance can compensate for his lack of match fitness. News flash – Sam Mitchell ($8,700 MID) finally broke a tag! The Hawk accumulator cherry picked his way to 130 MB last week and proved he’s a class above 2nd-rate taggers like Dumont. Expect Mitchell to have to wriggle out of a mediocre tag from a Hutchings/Nelson type this week as he carved up the Eagles back in Round 2 with 37 touches forming the foundation of a 146-point belter. The big question is; can Mitchell break that tag for the second week running? Luke Shuey ($8,900 MID) been in great form this year, but a serious knock on him has been his lack of ceiling in fantasy – he’s always been more of a SuperCoach-type player where effectiveness and influence is king. In the 7 games leading up to last weekend’s GWS game, all his scores ranged between 97 and 112 MB…. Then BOOM! Shuperman threw on his cape and pumped out a 148 against the Giants. Unfortunately, Shuey’s outlook remains the same for this week; expect another score in the low hundreds without a Brownlow vote-worthy game. Brendan Whitecross’ ($4,900 MID) last four scores read 95, 75, 84 and 80. For under $5k, these are solid totals and he’s worthwhile picking up once again this week. A well-known flat-track bully, Josh J Kennedy’s ($7,500 FWD) output often aligns with the Eagles’ on-field success as a team. In fact, he averages 102 MB in wins this year compared to just 82 MB in losses, and that’s with a decent set of data behind him. His 100 points against Hawks last time was his highest score in a win this year, so you have to ask yourself: Do you think West Coast can win on Friday night? The Eagles at home are always a threat, so I’m backing in JJK at his generous price. In what has been a very un-Jack-Steven-like few weeks from Jack Steven ($9,000 MID), scores such as 65, 70 and 75 have plagued his resume of late. His numbers are way down across the board, but what’s really hurting him is his ‘bonus’ stats – the mark and tackle categories that can often go under the radar for casual footy viewers. Ouch. Steven’s TOG has been pretty consistent through this lean patch so it doesn’t look like there’s anything medical to blame – just a slump to end a long season. Steven has the potential to go huge on any given Sunday but his form is a massive worry and it’s an ‘avoid’ from me. Sign up to get involved with the Moneyball fun here. Put simply, Lachlan Hansen ($5,000 DEF) is DFS Russian Roulette. The positives are that a) he managed 97 MB last week, b) he’s cheap, and c) I haven’t forgotten his incredible run during the 2013 season where he averaged 96 AF over a 10-game stretch. The downsides are strikingly obvious; a lack of exposed form, his injury-magnet of a body and the fact that he normally needs huge mark numbers to pull out a notable score count against Hansen here. Robbie Tarrant’s ($6,600 DEF) output has been solid for weeks now, with scores of 82, 83, 80 and 82 leading into last weekend’s 112-point crescendo. His scoring profile is quite varied for a key defender – yes, he’s pulling down 8 marks a game in that span, but he’s also adding 17 touches and 4 tackles per game. For that reason, Tarrant ranks as one of the safer backline picks this week, in my opinion. He’s undoubtedly been one of Collingwood’s best players in recent weeks, averaging 94 in the past three. James Aish ($6,000 MID) has been made to earn his midfield minutes over a long season and now it’s paying off for astute Moneyballers. If you weren’t convinced with his output increase alone, Taylor Adams’ injury might tip you over the line with the extra MID time on offer. Let’s play a quick game of ‘Guess Who?’ – Which defender for the fledgling Suns has been ticking along at 94ppg in the past 7 weeks? I guarantee that you didn’t even consider Steven May ($6,600 DEF), because, why would you? This blistering run has included scores of 127 and 131 which shows that May has a surprisingly tasty ceiling, evident in the fact that he’s ripped down 9 marks or more in 5 of his past 7 games. There’s not much that I need to say about Rupert Wills ($4,200 MID), his name is mainly here for my OCD when it comes to completeness. He’s scored 87, 91 and 100 since debut, clocking over 10 tackles per game. Lock and load. No one make any sudden movements, but remember that Gray can is FWD eligible and relatively cheap. Hint hint. Touk Miller ($7,300 MID) has been a shining light during Gold Coast’s injury decimation, averaging 104 over the past 6 weeks – and that includes monster totals of 139 and 141. In fact, Miller has been easily Gold Coast’s best fantasy player since Round 16 – averaging 105 AF – with the next best being Tom J Lynch on 92 AF. Need I say more? Meanwhile, at the slightly more successful expansion club, Stephen Coniglio ($9,100 MID) is having a belter of a year and has notched 5-straight Moneyball tons. He smashed out 131 MB against the Dockers earlier in the year and, considering that Coniglio’s average of 101 AF against Freo is his best against any club, all signs point to Cogs this week. So it goes without saying that I’ve done a 180 here, and I’ll be picking Martin if he fits nice and snugly into my $60k salary cap. Mitch Brown’s ($6,400 FWD) been huge this past fortnight (149, 111 MB) and I’m not one to question a purple patch of form. The key to Brown’s success has been his marking prowess, ripping down a massive 29 marks in the past fortnight alone. He’s worth a gamble in my opinion, particularly as he won’t soak up a crucial MID slot for the Hail Mary play. Criminally under-priced due to injury and a couple of lean return since coming back, Luke Dahlhaus ($7,500 MID) was back in a big way last week with a team runner-up 117 MB. The Bulldogs are lacking a few big name MIDs, so expect Dahlhaus to have every opportunity to put together a big score in the guts. 111 was the top-score for the Cats last week, posted by none other than the lesser brother Scott Selwood ($4,700 MID). As a DFS pick, he’s too cheap to overlook – especially with all the guaranteed MID minutes he’s soaking up in a tagging role. Speaking of, Dayne Zorko ($9,400 MID) was eye-catchingly influential last week for Brisbane, so don’t be surprised to see Scooter shadowing him all day. Has anybody drug-tested Dom Tyson ($8,300 MID) lately? I jest, but seriously… He’s on an insane streak right now and you almost can’t leave him out on a points-per-dollar basis. Carlton is a mess right now and Tyson is well placed to wreak further havoc with their midfield on Sunday. I’m a big fan. As predicted in this article last week, David Zaharakis ($7,000 MID) dominated without a tag and, thankfully, the Bulldogs have only sent out a defensive job once this year (Dangerfield back in Round 13). After Zaka collected 133 MB last week, are you brave enough to suggest he won’t go big again this week if he remains tag-free as expected? Brisbane key DEF’s are glorified witches hats (and have been all year), making Tom Hawkins ($6,600 FWD) the closest thing we have to a lock this week. He managed 4.4 and 90 MB against them earlier this year, and even perma-spud Levi Casboult posted 4.2 and 95 MB against them last week. Money for jam!